Autumn: these yellowing Ginkgo leaves with green edge are growing on some parts of the Ginkgo tree in my own garden, lovely! * Added to my Art-page (picture gallery): Ginkgo sculpture by Gerri Grijsen + Floriade 2012. * New photos photospecial page: Wild Ginkgo trees in Dalou Mountains, southwestern China: forest + seedling. Photo taken at Chengdu University of Electronic Science and Technology, Sichuan, China. 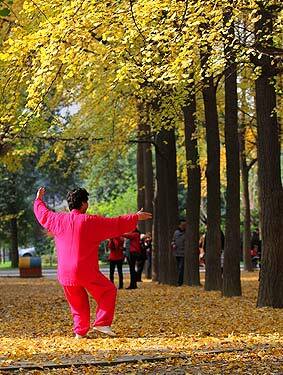 This granny practices Tai Chi among the over 1,600 Ginkgo trees on this campus. 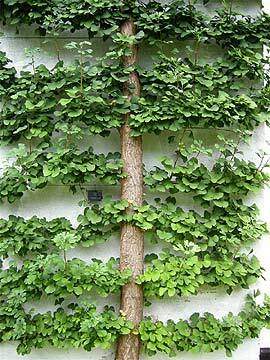 "The stiff habit of the branches makes the Maidenhair an ideal and unusual candidate for training against a wall, a lovely example of which you can find on the north wall of the listed arts and craft building in the centre of the Garden, Cory Lodge. This treatment pays homage to two outstanding, espaliered Maidenhairs that were planted against the New Botany School (now the Department of Plant Sciences off Downing Street) when it opened in 1904. The Garden’s Arboriculture team prune and train the espaliers annually in late winter, tying in the leading shoots and shortening spurs to three or four buds. Today, these espaliered Maidenhairs are immense, having reached over 13 metres, and frame many of the windows. The logo of the Department of Plant Sciences is a Ginkgo leaf set within a double helix." Read more and view more photos (+ enlargements): CUBG website. 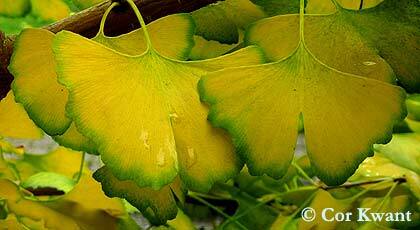 More Ginkgo espaliers on my website. This Ginkgo tree in Nongso, Seonsan, Gumi-si, Gyeongsangbuk-do. in South Korea is said to be at least 400 years old. Natural monument 225. 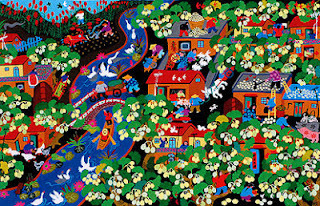 The tree is revered as the village protector. The villagers gather before this Ginkgo on the first "horse-day" of the tenth lunar month of the year to pray for peace and prosperity. According to legend, a Mr. Eom planted this tree.